It’s the year 2036. A virus has swept through the country (the world?) that causes everyone to become sterile between the ages of 18 and 20. The result of this virus is that adults are now encouraging teen pregnancies, so they can have children and the human population can continue. Of course teen pregnancy then becomes a multi-million dollar industry involving DNA testing, agents, and the perfect “man brand”. There’s even a drug that prevents the teen mothers from becoming emotionally attached to their unborn children. It’s a pretty simple premise really. Within this framework, we have the story of twin girls, separated by birth into completely different lives. There’s Melody, who was adopted by a pair of professors who predicted the free market that would surround teen pregnancy before money began exchanging hands. 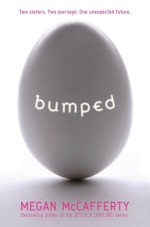 Her entire life has been based around bumping professionally (the casual slang term for the act of getting pregnant). She had tutors, coaches, and instructors, anything she needed to become the absolute most perfect donor by becoming good at everything. Still I shouldn’t have liked this book. It’s full of teen drama and misunderstandings, and a boy and a girl who clearly want to be together and therefore will be by the end. It has slang all over the place and even a reference to a duo of rappers that are probably Brittney Spears’ children. And yet, I loved just about every minute of it. I liked the tongue-in-cheek quality to Melody and fish-out-of-water Harmony. I like that this was based in a world that could so easily be our own in 25 years. The chapters switch between the twins’ perspective, first Melody and then Harmony and back again. Considering most chapters are no longer than 8 pages, that should have been annoying and left the story stuttering and stopping, but it didn’t. The quick vignettes from one perspective and then the other keep things interesting. You’re never with one girl long enough to get bored with her and her perspective of the world. I wasn’t expecting it, but there were sci-fi elements to the story that I really appreciated after I finally understood them. I either missed something or the MiNet wasn’t clearly explained until much further in the story than it should have. I didn’t realize that it was contact lenses and that’s what all the blinking and eye rolling was about until over halfway through. For whatever reason, I thought it was a handheld device that was controlled through eye movement. Perhaps I was a little dense… It also took me about twenty pages to realize that, at the opening of the story, Melody is shopping for an electronic simulation belly and she wasn’t actually 40 weeks pregnant. I was incredibly confused. The bible and God talk did become a bit much, especially later on when a character who doesn’t seem to be a “churchie” turns out to be one. The biblical euphemisms could have gotten completely overwhelming if it wasn’t for each section only being three or four pages. At the same time, it proved how naïve and overwhelmed Harmony was in this foreign and scary outside world. The part I hated the most and made me groan out loud? That, with another twenty to thirty pages, this book could have been complete. It could have been a whole and complete story. But no. YA books are no longer allowed to be standalone stories. They all have to be the start of a series and so a few tiny strings are left untied to necessitate a sequel. Though I suppose that means more of Zen, the silly, incredibly talkative male best friend, who I want in my real life, so it can’t be all bad. * The book is already back at the library, so I can’t check to see.